Aurora are running free smart lighting sessions across the UK for electricians wanting to become smart lighting installers for the AOne range of products. Demand for smart lighting is growing. 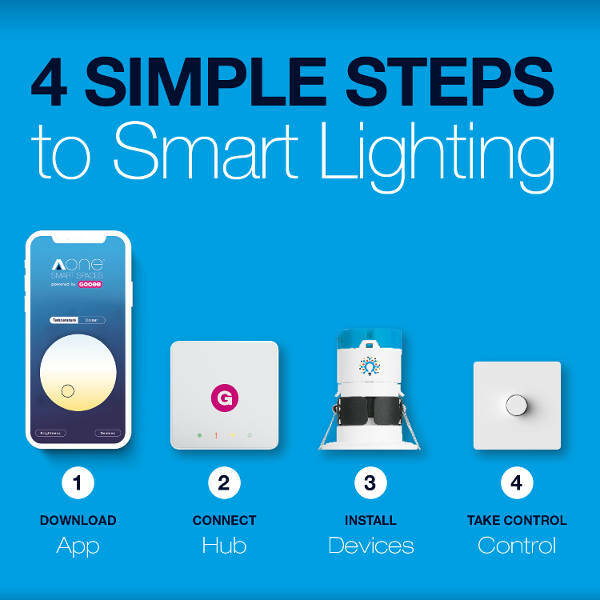 If you are an electrical installer wanting to understand Aurora Smart Lighting systems and learn how to install it in 4 easy steps then contact Aurora for more information. Visit Aurora for more details. Save time on monthly testing with Flex 7 integrated emergency testing. There is no need for separate switches for each circuit or phase, one key switch can test emergency luminaires across multiple circuits or phases as they can be networked together. Simple to install Flex lighting controls operate at protected extra low voltage. They avoid scenarios where multiple key switches are grouped in a centralised, multi-gang enclosure with the potential for numerous 230V or 415v circuits to be present. Visit Flex for more details. Cablelay, the latest addition to the Marshall-Tufflex Fast-Coupling Wire Basket System. Cablelay is designed to minimise risk of damage during installation of cables and can be placed in lengths of wire basket or tray, this protects cables from protrusions, sharp edges and kinking ridges, which maintains the integrity of cables laid on top. Cablelay Matting, a lightweight 6mm flexible mat, for easy and fast installation. Cablelay Matting has a Class 0 fire standard meeting British Building Regulations - passing both BS476 parts 6 and 7 for fire propagation and surface spread of flames. It is available in various widths to match the wire basket and rolls are joined using Cablelay Tape, which maintains the Fire Standard and stops joint movement. Cablelay Rigid, a 3mm LS0H compressed foam sheet that also comes in a variety of widths to suit the wire basket. Cablelay Rigid conforms to Class 1 (British Standards test 476 part 7). Visit Marshall-Tufflex for more details. 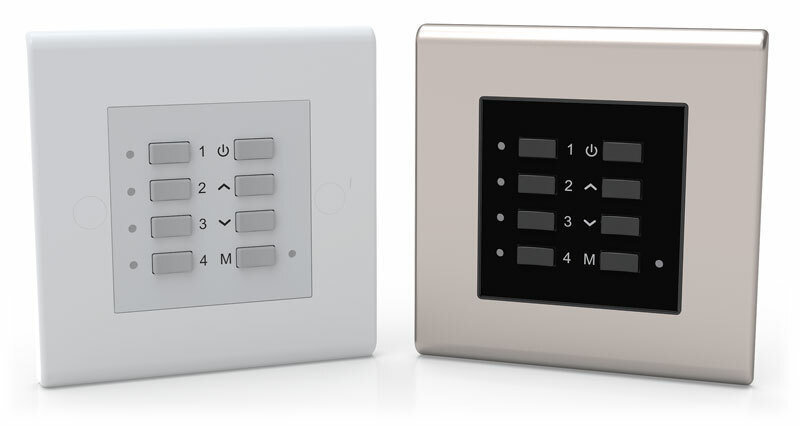 The latest edition to Flex lighting control range is a new scene setting panel to go with flex 7 ZoneLite. Available in black or white, with an option of a white or brushed steel faceplate. As with all the flex7 range connection is a simple plug-in by way of a RJ12 plug. It can also clip into any 50x50 euro module faceplace and requires a 30mm backbox. The Panel can accommondate 4 lighting scenes from memory and have the ability to be dimmed up or down while in use. Should occupancy control be required a flex 7 PIR sensor can be used with the panel. Extra panels can be daisy chained to a controller. Integrated control of luminaires on the flex 7 Zonelight, Type T designed for educational environments and Type G for commerial and office settings, gives power to the lighting layout. Marshall Tufflex desk modules are pre wired, pre tested and offer a variety of power and data outlet configurarations. The data modules are fire retardant and can be feed from various soures including trunking, floor boxes, powerpoles, etc. An underfloor busbar can feed these units via floor grommet to an RCBO unit, which can then feed modules as required. Modules incorporating 5Amp USB points charge up to five times faster than standard PC ports, with with added benifit of less power wastage. Visit Marshall Tuflex for more details. Firefly is the new fire clip from Marshall Tufflex designed to comply with the latest fire regulations. Firefly clips a designed to secure cables when using Mini and Maxi trunking and conduit. In the event of a fire the clip secure cable runs from falling in order to comply with fire regulations. There is an internal version for pre cable install and also an external version for retro fitting of existing installations. The clips are spring loaded for quick installation and have a melt point of 1000°C. The range size includes 25x16mm and 50x50mm. The TPOne Programmable Room Thermostat is one of the latest heating controls for domestic heating available from Danfoss. Hot water cylinder timing is featured as well as the 7-day programming and a holiday function. When crono-proportional control mode is selected the thermostat uses a fixed cycle rate and determines the duration of On/Off periods for each cycle in order to optimise boiler efficiency. It has a backlit led display, a set-up wizard and offers one touch control. Temporary changes can be made for comfort control and automated control will resume on the next heating change. Three versions are available: Wired, Battery-powered or Wireless. 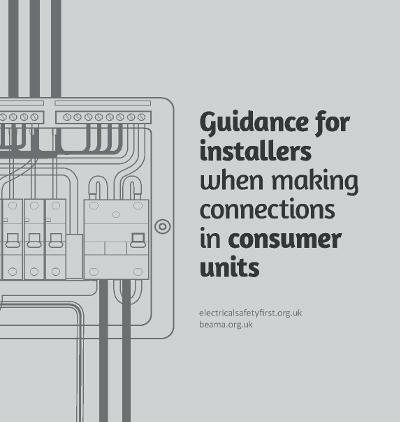 The BEAMA ESF have released a technical guide on consumer unit connections best practice. Fires involving consumer unit have been increasing in recent years. There a various factors contributing to this including the results of poor work. This is part of the reason for the recent changes in regulations on materials used in the manufacture of consumer units and enclosures for them. Download the Technical Guide to read the BEMA ESF guidance on correct cable preperation and connections. The Aico Multi-Sensor Ei2110e uses the latest high-tech developments enabling it to respond to all fire types. 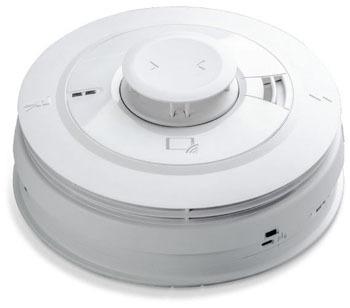 With its new multi sensor Aico claim this is the most effective fire alarm on the market for domestic installations. The alarm has an increased resistance to false alarms and is easy to install with a modern design. The Ei211e is compatable with existing Aico alarms, and expansion of the system is made simple with RadioLINK+ technology. AudioLINK provided alarm data extraction, with RadioLINK+ for wholesystem data extraction. Marshall-Tuflex recently launched a new aluminium truncking system for electrical contractors - Elegance 170. Aimed at the educational and office environments, it features rounded courners, is lightweight and hardwearing with additional mechanical strength. The new 170 x 55mm version has additional cable capacity compared with the smaller 110 x 55mm range. It comes in powrder coated silver grey as the standard finish and is also available in white subject to lead time. It is compliant with Part M, Cat6, 6a and 7. The trunking offers 1, 2 or 3 compartment with a sigle cover and has pre punched divders for quick installation. Elegance 170 is compatible with both conuit and mini trunking. 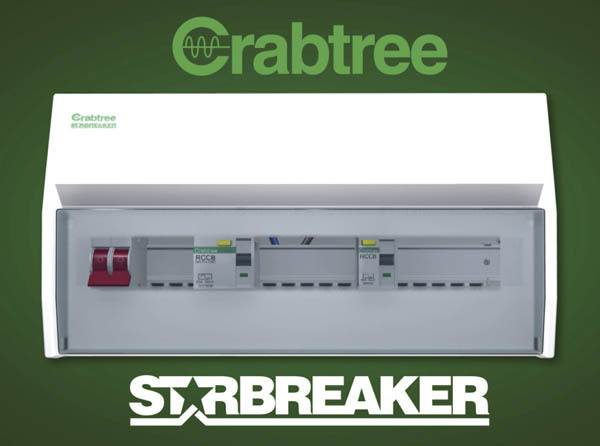 It is estimated that Starbreaker electrical consumer units have 25% fewer connections to be made speeding up installation time. The factory assembled 17th edition device has an integrated busbar for greater protection, with no live prongs. Plugin MCBs guarantee connections and save on install times. Circuits can be added or upgraded without removing the busbar and it is fitted with high capacity tunnel terminals. The Din rail accepts din, bell transformers, contactors and meters in any unused way. Incomming devices and RCBs are already fitted. There are fewer interconnecting cables, which gives increased wir8ing space. The device has large knock outs for rear cable entry and side knock outs for surface or hidden electrical wiring. It has space to route wring with top and bottom access. Danfoss release living eco its latest programmable electronic thermostat for radiators. It is estimated that a 15% saving can be made on heating bills by replacing old thermostats with the living eco. It has push button programming and a digital display. Various settings allow for either a constant temperature to be set for all day or lower temperatures at predefined times of the day to save energy. An additional function closes the valve if it detects a large drop in temperature to prevent heat from being wasted – if for example a window is opened. Greenwood Airvac release their most innovative and unique fan to date, the Omnique. It is ideal for maintenance response, where the ventilation is unknown before the visit because with 6 key control methods (Basic, Timer, Humidistat, SELV, Continuous and Pull cord) the Omnique is suitable for most applications. The Omnique has replaceable components for servicing and touchpad controls for 100% adjustable motor speed to set airflow and ensure compliance. Greenwood CommissionSMART™ technology provides easy to installation and commissioning. Green credentials include an ultra efficient low watt electrical motor to ensure the lowest running costs and a unique shutter which only opens enough to allow the extraction rate required for the room. Further reductions in energy wastage is achieved by using Greenwood HumidiSMART™ and TimerSMART™ technologies providing intuitive performance with the installed environment to operate only when needed. 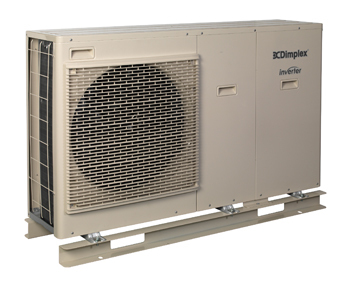 The new Air-Eau range of inverter driven heat pumps offer low noise and ease of installation as well as performance and energy efficiency for both new build or retrofits according to Dimplex. The system is designed to work with radiators as well as underfloor heating with outputs from 6-16kW offering variable water flow temperatures of 35C – 55C. A variable speed inverter controlled compressor means heat pump capacity is maintained in cold weather, eliminating the requirement for backup heating. Only the hot water tank and control value are located inside the building the rest of the configuration is maintained in a single housing outside. For more details go to the Dimplex Air-Eau site. Estimated savings of up to 18% are achievable on household electric bills according to Marshall-Tufflex with Volis Home is installed. This should equate to around £150 a year for a family of 4 in a 3 bedroom semi according to their figures. Electrical equipment manufacturers supply equipment that works between 207 and 253 volts. If the UK voltage is supplied at around 240v then there is a potential over supply, which wastes energy and money because heat or vibration is produced to handle the extra voltage. The wall mounted unit is easily installed by a qualified electrician. It will typically reduce voltage to a more suitable voltage at around 220 volts and can handle 40 amps continual load with a 60 amp overrun for 30 minutes. Running at a more suitable voltage should also increase the life of appliances. For more details go to the Marshall-Tufflex site. Fireguard LED7 is an IP65 fire-rated downlight using the latest energy efficient LEDs. The 7W LEDs equate to a 50W halogen providing an estimated electric energy savings of over 80% against halogen lamps. It comes with a 75,000 hours lamp life and 10 year warranty. As with the rest of the Fireguard range a seal to the ceiling cut out and additional intumescent material are designed to swell and seal any ventilation gaps in the event of a fire. It also utilises a metal fire-resistant enclosure to prevent flammable dust and debris from building up through the life of the fitting as per the guidelines issued by the Electrical Safety Council. The thermoplastic intumescent plug is patented and is designing to provide improved ventilation maintaining the life of the light source swelling up to 80 times under extreme temperature conditions to seal the back of the fitting in the event of a fire. A smooth even spread of light with a 38 degree beam angle is achieved with its six LED chips and its unique lens design. The dimable version can be used with a wide variety of standard dimmers and has been designed for easy retro fitting into existing downlight installations with an integral LED driver for both low voltage and mains voltage. For more details go to JCC site. Greenwood Airvacs new Centair PIV continuous whole house ventilation solution provides a healthy life indoors in comfortable and reduces carbon emissions. Utilising free solar generated heat created within the loft space, all rooms can be ventilated from a single point. The heating in the house can be turned down as a result of the Centair PIV pushing warmer air from the loft spaces into the home, which saves energy and money. Mould and condensation problems are eliminated as the unit replaces air contaminated with allergens and VOC’s with fresh filtered air providing health benefits to the occupants and protection to the building. 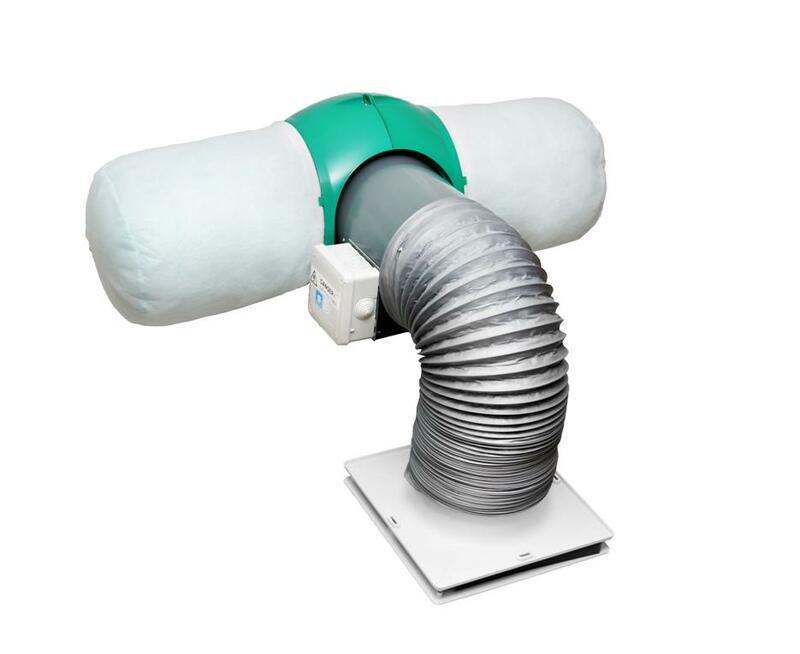 Greenwood say that the system is easy to install with limited ducting and only one external penetration and is suited to both new builds and retro fit for existing properties. The system is ultra quiet, discreet, with low running costs and a 5 year guarantee. Contact Greenwood Customer Services on 0870 900 1880 or visit Greenwood for more information. 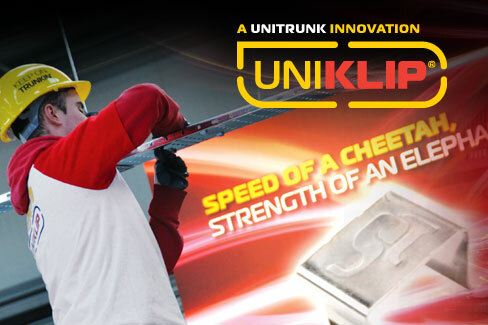 The new Uniklip system, which is part of Unitrunks Rapid Installation Systems range, demonstrated its ability by completing a time trial on average 3 times faster than a conventional system. This means electrical contractors can reduce the times when estimating installation using this system. The ‘Cheetah Challenge’ invoved a 40-metre course to test the equipment on a typical installation ending in a twenty metre installation ‘sprint finish’. The removal of the need to cut, screw and tightening components throughout the job makes the insatallation much faster. Uniklip uses fewer components and snaps together. It has proved popular with specifier, designers and system integrator since its launch a year ago having been included in a large number of installations, which include the Prince of Wales Natural House featured at the Ideal Homes Exibition. 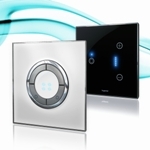 Arteor provides complete co-ordination across wiring devices and home automation products. It handles basic switches through to the advanced automation systems making it suitable for commercial and residential use. The new energy management system monitors the use of gas as well as the use and production of electricity. It is difficult to estimate the size of this market, but the new range should give electrical contractors new avenues of business for those that embrace this new technology. Cablofil claim their fast assembly system is up to 35% faster for electrical contractors to install than a traditional sheet steel system. Because of the reduced amount of components required to fix on site there could be possible saving on material costs as well as the labour installation cost. It is estimated that it can be 27% stronger and 55% lighter than perforated cable tray and that the systems “safety edge” protects both installers and cable on installation. Adaptaflex have introduced a new Type PF flexible conduit system. Adapaflex say the conduit can be used for both internal and external use and is ideal for use with rolling stock and locations with low temperatures. It has high impact resistance with an operational temperature range of -50C to 110C. Made from flame retarded polyamide, it is self-extinguishing. The conduit is available as standard or heavy weight from 10mm to 54mm. Achieving 0.47W/l/s, with an exceptional 93% heat transfer, and incorporating new, innovative Greenwood SMART Technology, the new Fusion HRV2HT takes one of the UK’s best performing heat recovery product to the next level. 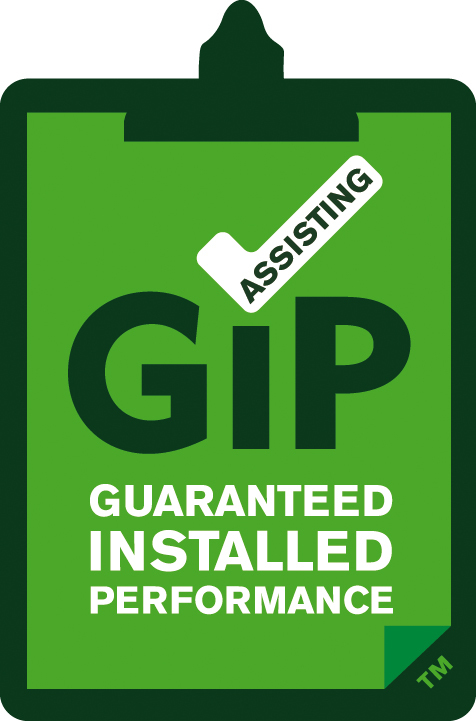 Assisting in the delivery of G.I.P (Guaranteed Installed Performance), new Greenwood CommissionSMART™ technology provides a fuss-free method of commissioning. SMARTer thanks to wireless technology, one single and simple to operate LCD controller can be used to set up, adjust and commission numerous units on-site, helping save valuable time, as the installer does not need to keep going back to the unit to make adjustment. Moreover, 100% variable airflow settings ensure Fusion HRV2HT meets Building Regulation requirements on-site first time. Ensuring year-round comfort for homeowners Fusion HRV2HT also boasts Greenwood SummerSMART™ and Greenwood WinterSMART™ technologies. Providing an intuitive response to seasonal variations they sense the outside temperature and automatically make changes to the way in which the supply air is delivered into the dwelling to create the perfect indoor climate all year round. Additional SMART features and technology improve the overall energy efficiency and performance of Fusion HRV2HT. Greenwood HumidiSMART™, a new way of using humidity to provide ventilation into domestic dwellings, reacts only to man-made humidity rather than a preset generic setting, and Greenwood TimerSMART™ measures the duration of occupancy to determine run time. Both technologies help remove nuisance running noise and reduce unnecessary energy wastage and heat loss throughout the year in the home. SAP Appendix Q Eligible, EST Best Practice compliant and Building Management System (BMS) compatible, Fusion HRV2HT is the SMARTest heat recovery product around. It is also the only product to feature a speedfit condensate connector which offers improvements in installation time on site and the sealing of the unit to the condensate piping. Compared with traditional fixing methods, Swifts Easi-clip (CKP25) is a fast and economical method for the installation of MRF cable tray fast and economical. Sprung steel, zinc-coated clip simply clips securely into place without the need for additional fixings. 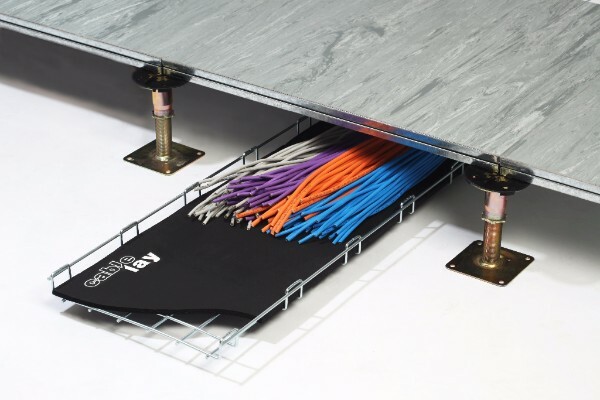 Faslock, which just needs to be located and then tabs bent into place is used with the installation of Legrand’s wire mesh tray for a strong, secure fit. The recent launch of the new range of Salamandre distribution trunking is at least 50 per cent quicker to install than its predecessor with its fast fit offering. Legrand has introduced lockable brackets to its consumer unit range which allow on-site health and safety requirements to be met by contractors for the safe and secure isolation of circuits in a cost effective and easy to use manner. The brackets are designed for use with Legrands 16 and 22 module surface mounted insulated consumer units. They are fitted around the consumer unit and can be secured with a standard padlock. They can be removed and reused once a site is completed. Greenwood Airvac launches Unity CV2GIP, the easiest to fit and commission dMEV fan in the UK – especially in line with G.I.P (Guaranteed Installed Performance), now a crucial part of the Building Regulations 2010. The ultimate single fan for all applications, Unity CV2GIP has been intelligently designed with speed and simplicity in mind. With fuss-free installation, Unity CV2GIP boasts over 8 patents and registered designs, including a ‘Twist-Lock’ front facia which simply turns for removal. On the inside, a unique hinge mechanism allows easy wiring access, with screws remaining within the casing to avoid misplacement – both especially valuable for ceiling applications. Unity CV2GIP also benefits from Greenwood CommissionSMART™ technology, one of six new SMARTer design features, new sensors or controls now included on Greenwood products. Specifically designed to assist in the delivery of G.I.P (Guaranteed Installed Performance), in line with Building Regulations, Greenwood CommissionSMART™ technology results in an innovative and unique touch-pad located at the front of the fan for fast and accurate commissioning. This touchpad has six simple buttons, including a 100% adjustable motor speed for accurate airflow set, assisting in the delivery of G.I.P (Guaranteed Installed Performance) – a new introduction through Building Regulations, in which all new build ventilation installations will require testing, commissioning and signing off onsite for Building Control. Greenwood CommissionSMART™ assists this process in the simplest and SMARTest way, helping installers get it right first time. Unity CV2GIP is also the most efficient and quietest running dMEV fan in the UK. Cablofil has launched PVC Cable Tray range to the UK market in response to growing demand for the company’s quality and innovation in damp and corrosive environments. Known as the company that has pioneered the use of the steel wire cable tray in the UK, Cablofil already has a range of stainless steel systems, such as its 316L product, that have been especially designed to provide exceptional anti-corrosion benefits. However, the company’s PVC range has already proved extremely popular both in France and Spain and growing demand for Cablofil products in the water industry and heavy industrial environments has prompted the company to offer the range here too. MK astral™, the advanced lighting system from MK Electric, the lighting control solution for those looking to enhance the ambience and atmosphere in any room or residence. Marshall-Tufflex’s revolutionary MT32 prefabricated wiring system, which can improve on-site installation times by more than 50%, is helping step up the pace of a £140 million building project that will transform the educational facilities of young people across the London Borough of Islington. Coupled with Odyssey trunking, which has the only all-curved trunking profile on the market, MT32 is providing economic and fast-fit installations at St Aloysius College, Highgate, which is one of eight secondary schools undergoing complete rebuilding or substantial refurbishment within Islington’s Building Schools for the Future (BSF) initiative. Near to completion, the redevelopment of St Aloysius College is an ambitious combination of new build and refurbishment to provide a new teaching block, sports hall, school hall and dining room along with major improvements to existing facilities. With building works delivered by Balfour Beatty Engineering Services (BBES), success has been dependent on key deadlines being met during each phase of the programme. At St Aloysius, MT32’s prefabricated wiring system, combined with Odyssey curved profile dado trunking, supplied by Edmondson Electrical, has been installed by Alba Electrical in the teaching rooms and offices serving the new sports hall. This successful product duo has also gone into general classrooms and IT rooms, where Odyssey serves every row of desks via a 32Amp cee-norm industrial socket. In addition, Marshall-Tufflex has provided Odyssey in specially curved lengths to allow for fixing to the corresponding architecturally curved walls of the library building. 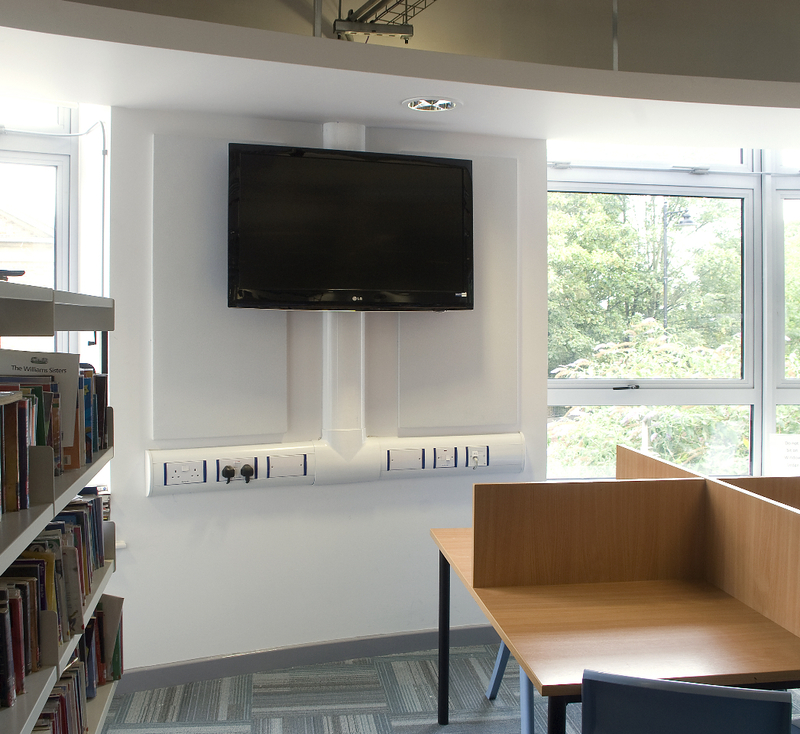 Only in the science rooms, where there is no data requirement and bench heights differ from desk heights, is Marshall Tufflex’s standard bench trunking installed. MT32 is a flexible cabling system using a compact 32Amp connector incorporating plug and play technology to carry power through trunking via plug and play connections and interconnecting pre-wired and pre-tested accessories. This provides safer, speedier and more cost-effective installation, circuit testing and sign off times. A further and major environmental benefit of MT32 is its ability to be reconfigured and re-used if required. The Odyssey all-curved profile containment system, with accessories fitted flush to the cover, is particularly popular in health and education installations for its aesthetic appeal and its practical, easy to clean and impossible to clutter surface. Following the success of its original push-in connector system – introduced in 2008 and now regularly achieving monthly sales of 40,000 – Click Scolmore has developed this product into a whole range and in doing so, brings to market the industry’s most cost effective Hub system. 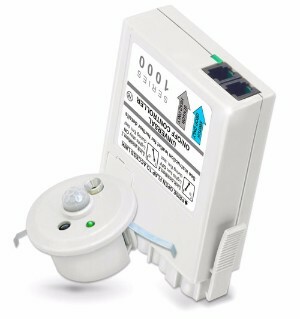 Providing electrical installers with a quick and easy solution when adding lighting or appliances to an existing circuit, the Hub CT300C is designed to take 3 or 4 pin plug-in connectors and can be connected directly to another Hub or via the three options of link cables which have also been added to the range. CT101C – the original 3 pin plug connector, now featuring increased load handling with 20A rating and with additional loop terminal. CT202C – a 4-pin connector with auxiliary terminals which provides the opportunity for a second switched live or permanent feed for use typically with emergency lighting applications. Link Cables – separate cables, available in three different lengths – 2m, 3m and 5m – each supplied pre-wired to a 4 pin (CT202C) connector to provide quick and easy connections between hubs and fittings. 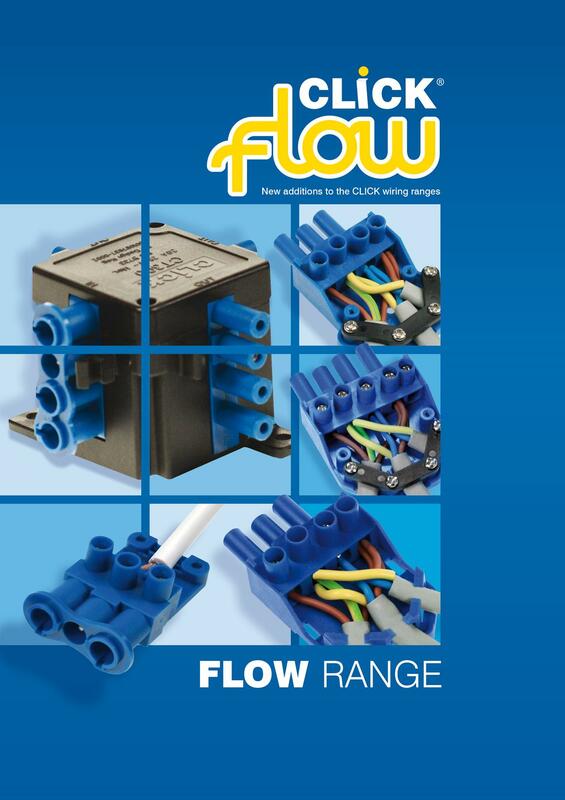 The new Click Flow range is now available to order. For more information email sales@scolmore.com visit Scolmore or telephone: 01827 63454. There are a combination of weatherproof switches and sockets, singles, twins and triples including RCD protected units that make up the IP TuffMaster range of electrical wiring accessories. For covered industrial sites, agricultural buildings and commercial areas the metal clad units are ideal. Enclosures are robust and UV resistant performing in temperature of –40°C to +70°C with protection to dust or splashing water. Their IP rated enclosure lids use specialist seal material along with a unique clipping action lock. This creates a constant pressure on the seals, which ensure water and dust cannot enter the enclosures. When released the seal material returns to its original profile. This provides a good seal when the lid is closed, regardless of the different cable sizes and profiles that may be used. T o ensure IP compliance, Thermoplastic elastomer rubber seals are used as bungs and cable glands. Scolmore add new Lucia & Maddi LED Bulkheads to their Fumagalli range. These 11W, 50,000 hours lamp life LED’s come with a Lifetime guarantee against corrosion and are IP66 rated. With LED technology continuing to lead the way for lighting, Click Scolmore announced the introduction of new LED bollards to its award-winning Fumagalli outdoor lighting collection in the summer. The Sauro and Mirella LED Bollards are produced as a single piece construction and provide energy efficient solutions to a range of lighting applications. There are two sizes of bollard – 800mm and 1100m – plus a wall-mounted version – with each available in a black finish with a clear lens and providing 18W (6 x 3 Watt LED) of light. New bulkhead posts have also been added to the Fumagalli product line up and they follow the launch earlier this year of the Lucia Round and Maddi Oval Bulkheads. The Gabri (1000mm) and the MiniGabri (750mm) posts are both available in either a black or white finish. By adding Fumagalli’s one-piece Remi Bracket, you can angle the lamp – or even two lamps – at 35° for much greater flexibility. 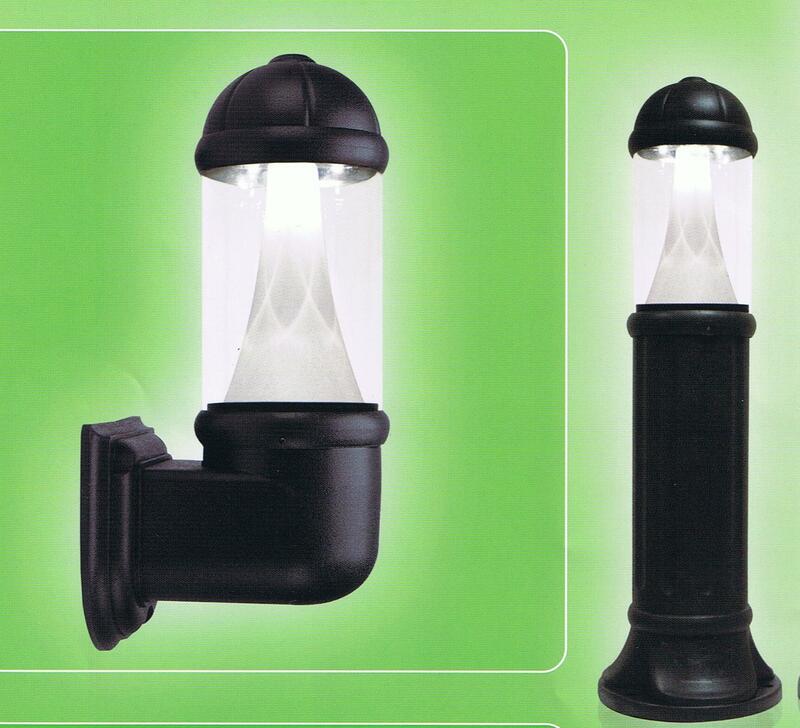 New product brochures for the LED Bollards and Bulkhead posts are available to download from the Marketing Hub at http://marketing.scolmore.com. Click Scolmore is the exclusive UK distributor for Fumagalli – the high quality lighting collection that provides the ultimate ‘fix and forget’ solution to a host of outdoor and indoor lighting requirements. Crabtree has developed a new range of energy saving, card-operated switches in response to a number of new required features as defined by its end user customers. The switches complement the company’s popular range of Capital Moulded, Capital Metal Plate and its prestige Platinum Low Profile accessories. As with other card switches, the device controls energy consumption in hotels and apartments by ensuring that electrical devices are not left on when rooms are unoccupied. It goes further than many other competitor’s switches however by providing a natural angled entry for the card and illuminating the slot itself, for much easier location and operation, especially at night in a darkened hotel room or corridor. Insertion of the key card turns the neon locator off in line with its energy saving credentials. Crabtree’s card switch is operated by a door entry key card up to 86mm x 54mm x 1mm, and controls the power supply to a room via a suitably rated contactor. The switch requires a mounting box of 25mm minimum depth. Catalogue 23 marks a departure from previous issues both in terms of design and layout. It is easier to use with an attractive practical layout and clear colour-coded sections for easy reference. New additions to the catalogue include the brand new Fireguard Plus range. Designed for extremely low energy performance at 5W (actual 4.7W), and exceeding 45 lumens per circuit Watt, Fireguard Plus meets the updated Building Regulations Part L and, as you would expect from JCC, passes the tests for 30, 60 and 90 minute ceilings. JCC has also introduced a new range of ultra-low energy LED lamps, which are set to deliver substantial energy savings. All products in the lamp range, which includes classic, candle and GU10 style lamps, plus an MR16 lamp kit, have exceptionally low Wattages and, in most cases, these lamps can be retrofitted into existing installations. Up to 90% energy savings can be achieved against a halogen installation with significant savings made on the through life costs of the products. Another exciting product development is the new Mainline three circuit track adaptor. This unique adaptor can be used with the entire JCC Aztek range and means that these single circuit fittings can now be quickly adapted to work on the new Mainline 3 circuit track. This provides maximum flexibility for a wide range of applications including galleries, hotels, bars, restaurants, retail outlets and showrooms. Also featured in Catalogue 23 is the new low energy Siletto backlit, wall and ceiling mounted luminaire. This stylish interior fitting is suitable for corridors, stairwells and other amenity applications and is also available as a three hour Tridonic emergency fitting. Available in a white or chrome finish, Siletto has a back illuminated feature that gives a halo of light behind the rim for a decorative focal point. 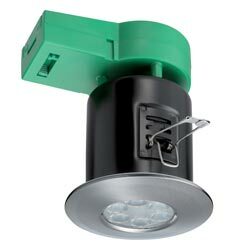 The popular Total LED range is highlighted in Catalogue 23 and is clearly marked with a purple band on the relevant pages throughout the catalogue, and JCC’s entire commercial range is available as a separate section with full photometric data, providing the electrical contractor with all the relevant information required to install the fittings efficiently. With over 500 pages of products and accessories, plus a number of new product ranges, Catalogue 23 is an essential tool for every electrical contractor. For more information or to download your copy, visit JCC Lighting or call 01243 838999. 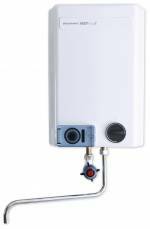 Redring, a leading provider of hot water solutions, has launched a new vented water storage heater. Building on the success of the popular WS7 water heater, the EcoT model features a 24-hour, 7-day programmable timer. Plumbed into the mains supply, this 7-litre energy efficient wall mounted water heater is suitable for dishwashing and similar applications. The integral timer offers the ability to program multiple on-off times throughout the week, making it perfect for installations in offices and schools for example where there is not a constant demand for hot water. The WS7-EcoT has a 3kW rating and an externally adjustable thermostat of 15°C – 75°C, with a frost protection setting. The unit is straightforward to install and is supplied with a wall bracket and full fixing pack. Additional accessories to the standard 300mm swivel spout include a 450mm or 600mm extended swivel spout or, alternatively, it can be fitted with a monoblock vented chrome mixer tap. An exclusive partnership between Click Scolmore and Energetic Lighting – the world’s largest manufacturer of energy-efficient lighting products – will see the most comprehensive range of price-competitive, low energy lamps being made available to the UK lighting and electrical industries for the first time. All lamps in the range are liquid mercury free. Instead they use Amalgam – the solid version of mercury that provides a safer and more environmentally-friendly alternative. The use of amalgam is part of our aim to minimise the environmental impact of our business. With current RoHS regulations setting the mercury level limit at 5mg, the majority of Energetic lamps already contain Amalgam levels of less than 2mg and developments are underway to bring this down to 1mg – the lowest in the industry. A one minute faster starting time than the average Compact Fluorescent Lamp is achieved with the Energetic Quick G-Start technology, which combines a unique thermal management system with acceleration in the vaporization of Amalgam. This can result in a light output of 60% in less than 15-20 seconds, depending on the product used. This technology in combination with the traditional incandescent shape makes it a true direct replacement for the standard incandescent lamp in look and feel and light effect, though saving 80% energy and lasting up to 10 years. Saving up to 80% on energy, and offering up to 10,000 hours of usage, all CFLi lamps come with a four year guarantee. Equipped with T2 tube technology, they offer a higher lumen output from a more compact bulb. There are more than 40 lamps which make up the range, including the unique ‘Dawn to Dusk’ lamp series which is equipped with its own light sensor to ensure instant illumination when night falls and automatic turn off feature when the light levels are increased. Dimmable CFLi’s which can be used with either a standard light switch or dimmer switch allow the lighting levels to be adjusted from 10-100%. 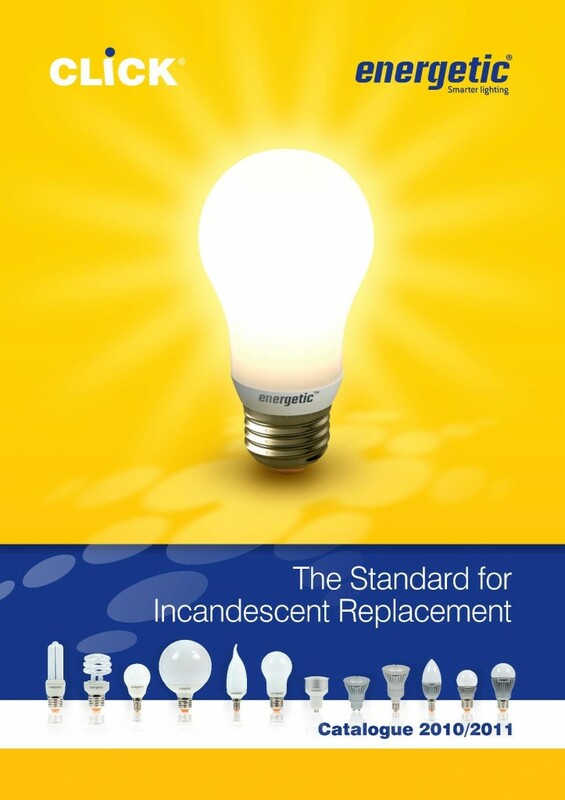 All the CFLi lamps in the range benefit from the unique ‘break-safe’ feature which sees a silicon coating on the inside of the lamp rather than the outside and is designed to prevent shattered glass and therefore confine the Amalgam in the event of a breakage. With LED’s increasingly seen as the future of lighting, Energetic has utilised this latest technology to develop its own high performance range which offers energy savings of up to 85%. Excelling in light quality, lifetime and appearance, the lamps range from traditional GLS, globe and candle styles to the modern 50mm diameter halogen replacements. A range of unique dimmable LED lamps is also included. The LED’s used give bright light output in conjunction with reduced radiated heat and they offer up to 30,000 hours lamp life. A six year guarantee is offered across the range. The launch of the new Click Energetic lighting division is supported with a 44-page, glossy brochure, which show all the products available and gives full specifications and features for each one. An advertising campaign and dedicated micro site on the Click Scolmore website will ensure that all the key messages for this new range are communicated to the widest possible audience. For further information on the Click Energetic range of low energy lamps, contact Scolmore on 01827 63454, or visit www.scolmore.com, where the Energetic brochure can be downloaded from the Marketing Hub. 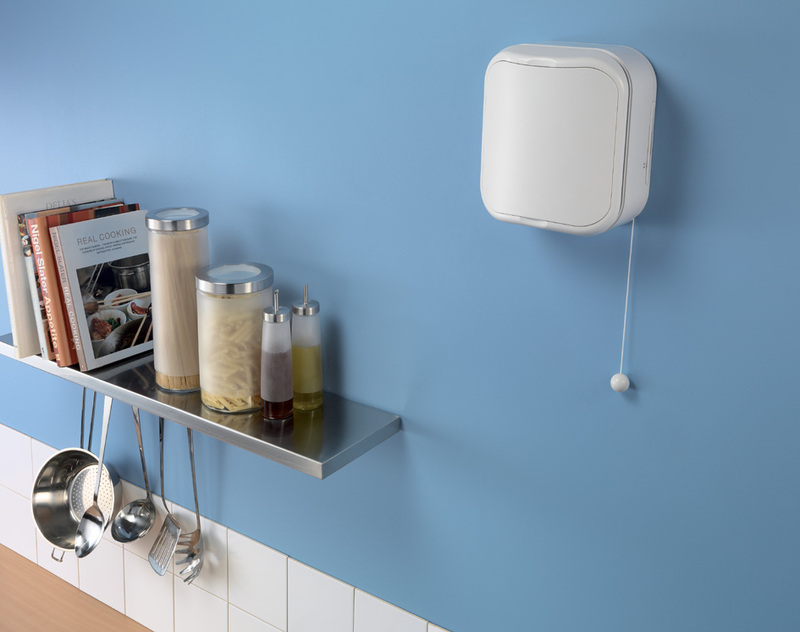 Bio Trunking Solutions pack an impressive punch, being 99.9% effective against MRSA, Klebsiella Pneumonia, E-Coli and Salmonella and a host of other hospital nasties that can prove fatal, particularly to elderly patients and those with weakened immune systems. Its success lies in the silver ion technology integrated into the cable management system during manufacture. The active antimicrobial agent is mixed throughout the PVC-U before the trunking profile is extruded, giving an even and thorough distribution of the agent throughout the product. 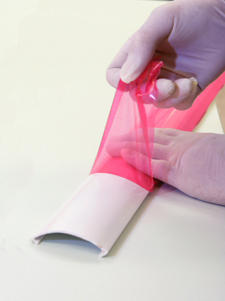 Because the antimicrobial is integral to the PVC-U it will not rub off. The system continues to work if the trunking is scratched or knocked, delivering 24-hour protection for the lifetime of the cable management installation. Since its acquisition by Siemens some four years ago, Wylex has been working behind the scenes to develop these new breakers, with the project involving the construction of a new production facility and specialist machinery to cater for the high volume demand for Wylex devices. First to market were the 10kA MCBs and matching RCBOs for the 3phase industrial circuit protection systems, followed now by the new range of 6kA domestic devices. The range known as NHX, includes B & C curve MCBs and B & C Curve single module 30mA RCBOs with ratings from 6A through to 50A. These devices are suitable for use in all-new and existing NH consumer units and, from June 2010, will replace the ever popular NSB range. Wylex will continue to maintain stocks of the NSB range in parallel to the NHX range for those customers that prefer for reasons of aesthetics, to match devices when retro fitting an extra circuit to an existing installation. With the revised Building Regulations Part F, Ventilation coming into force in October, a ‘qualified’ installer is now required to commission all new ventilation systems, whether they are simple extract fans and background ventilators or whole house ventilation with heat recovery, and provide a commissioning report for the Building Control Body. Until now, there has been no specific qualification for what is, to all intents and purposes, a new trade: Domestic Ventilation Installer. However, this has all changed thanks to Polypipe Ventilation which has now produced the first industry-recognised independent accredited training programme for Ventilation Installers. For anyone involved in the H&V installation industry, this represents a genuine new business opportunity. The new two day training course combines theoretical training and practical exercises to provide installers with the information and skills to install any of the common types of domestic ventilation systems in the UK safely and efficiently. The course also covers the inspection, test and commissioning of these systems as well as the provision of client operation and maintenance information. At the end of the course, there is a theory and practical assessment in which each candidate must pass. Delegates will be expected to have a background in plumbing, heating or electrical engineering, either with a number of years’ experience, or with (or working towards) a formal qualification at NVQ Level 3 in these subject matters. The new course has been written by Polypipe Ventilation’s Technical Manager Jon Hill and independently assessed by Ian Andrews Associates. The scheme is being run by independent training company BPEC, an industry recognised training organisation which already provides ACS, OFTEC, ECS and other renewable certification. The training course will also be open to colleges across the UK and is being supported by Polypipe Ventilation with a comprehensive training kit. The first domestic Ventilation Installer training courses accredited by BPEC are taking place in October at Polypipe centres around the UK. For further information, go to polypipe or call on 08443 715523. The RF Control System is the first product to be launched through Click Scolmore’s newly-created ‘home automation division’ which has been set up in collaboration with leading European electronic devices manufacturer, EKLO EP. The Czech company has been established for 17 years and currently exports a range of products – including the iNELS brand of home automation systems – to more than 60 countries worldwide. Switches can be mounted on glass, wood or walls and can be moved or relocated freely, making them totally flexible. Programming is extremely straightforward – the transmitter is easily connected to the receiver with the push of the corresponding buttons on the appropriate devices. The RF control unit connects all the units in one intelligent wireless system with portable and remote control operating at a distance of up to 200m. The RF Touch – a touch screen control panel – provides centralised control and visualisation of the RF System. Heating, switching, dimming, controlling of shutters, window and door opening can all be set and adjusted from one single control panel. An in-built clock provides the ability to set daily/weekly switching programmes and also to simulate occupancy when the house is empty. Complete control and regulation of heating and lighting means that energy need only be consumed when required thus leading to a reduction in energy bills. A dedicated training facility has been set up at the company’s Staffordshire head office to allow demonstrations and training sessions to be delivered to relevant partners. A room set has been created that will allow the various elements of the home automation system to be demonstrated. 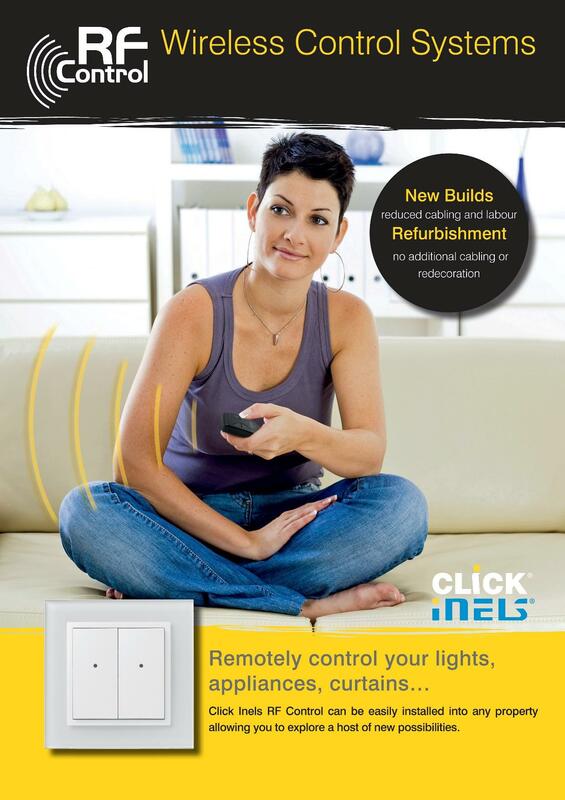 While the new RF system is being channelled through the electrical wholesale sector, the next product that will emerge from the Click iNELS division will be a wired home automation system which will be available through the specialist installer network. For further information and a copy of the new Click iNELS brochure, contact Scolmore on 01827 63454, or visit scolmore. Cable management specialist Marshall-Tufflex has launched a smart new range of pre-wired office furniture desk units as part of its Underfloor to Desk Solutions range. The units provide a neat, safe and stylish method of delivering power to desktop devices such as computers and printers, replacing messy and potentially dangerous trailing power cables. Power can be delivered directly from Marshall-Tufflex’s MT32 plug and play 32Amp power distribution system or via Marshall-Tufflex’s Series 507 or any other powertrack sytem. The system is fully segregated with Clean Earth (CE) and standard versions available, together with optional MCBs and RCD protection. The desk units comply with BS 6396 for Electrical Systems in Office Furniture and with BS 1363-2, where applicable. Colour coding indicates red for 3.15Amp and yellow for 5Amp. The desk units are also compatible with a range of prefabricated wiring systems using standard 16Amp connectors and compact 32Amp connectors. Units are supplied as standard in black ABS and aluminium. However, aluminium units required with a silver-grey anodised finish are also available by contacting Marshall-Tufflex’s Technical Team. Full details of the new office furniture desk units are available in Marshall-Tufflex’s newly launched Underfloor to Desk Solutions brochure, a full-colour 40-page brochure which comprehensively outlines where, when and how its underfloor to desk systems (including Series 507) work, with photographs, clearly annotated pictures and exploded diagrams detailing technical, specification and installation information. ABB has released a new generation of control gear, including contactors coupling energy saving technology with simplified specification and ordering. The latest development in ABB’s 120 year heritage in the design and manufacture of motor control equipment, the new range offers a raft of exciting benefits for end users, stockists, installers and OEMs alike. A key feature of the new range is the use of ABB’s groundbreaking AC/DC electronic coil technology. Covering both AC and DC voltages between 24…500 V 50/60 Hz and 20…500 V DC, the coil has reduced the number of contactor types by 90%, from 2,500 to just 250 parts. This makes it particularly ideal for OEMs and distributors by making the range both easier to specify and stock. With its reduced AC pull-in coil consumption from 30% (for AF) to 80% (for AF…Z), the contactors deliver less losses per phase and generate less heat, enabling users to improve the energy efficiency of their panel systems. The extent of these efficiency improvements can be highlighted by comparing the new 4KW AF09 contactor, with its reduced holding power of 2.2 VA, with a typical older generation 4KW device offering a holding power of 8 VA. If both contactors are energised for 14 hours everyday over the course of one year at £0.07p / kWh, the AF09 would offer an energy cost of 71 pence compared to over £2.58 for the older generation device. When multiplied by the estimated 10 million 4 to 18.5kW contactors currently in use in the UK alone, the potential savings that could be achieved by introducing ABB’s new contactor range quickly become apparent. Even greater savings can be achieved where the new AF…Z low consumption coil contactor is used. Designed for direct connection to PLC outputs (24V DC 500mA) in process applications, the AF…Z contactor offers a holding power of just 1.7VA. Based on the above comparison, the device offers an energy cost saving of around £2.04 per contactor. 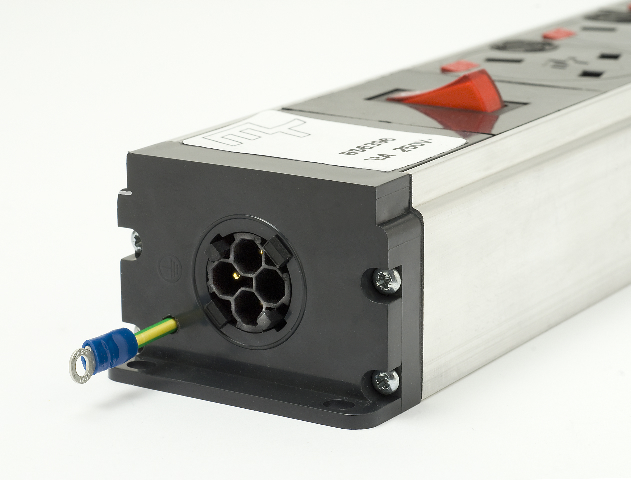 By eliminating the need for an additional interface relay, the AF…Z also greatly reduces the time, cost and space previously required for connecting to a PLC. For installers, the new range’s standardised 45mm housing also enables it to be easily integrated into an existing installation. Around 33% narrower than other products on the market, the range helps save space, enabling operators to reduce both the overall size and cost of their panels. With no need for mounting plates, the cost and time of installing reversing or star-delta starters can now be reduced, with installation times typically cut by over 50%. A key benefit of the AF contactor range is its ability to manage the effects of unstable voltage conditions caused by poor network conditions, motor inrush current or voltage drops along cable lengths. As well as extended coil operating limits, the new AF contactors feature built-in surge protection, eliminating the need for an extra surge suppressor and providing added reliability and safety in the event of voltage fluctuations. With a choice of left, right, top or bottom mounting options, the AF contactor range also offers groundbreaking flexibility during installation, by removing the disruption caused by incompatible or wrongly sized products. The new contactors are just part of a wider family of new modular motor control and protection devices, which also encompasses manual motor starters, softstarters and relays. ABB’s MS132 manual motor starters, rated from 0.1 to 32A are used to manually activate and deactivate motors up to 15kW / 400 V. Fuse-less protection against short-circuits, overloads and phase failures reduce maintenance time in the event of a failure and enable a compact switchgear cabinet layout, helping save time and money. Other features include overload protection to trip class 10, with short circuit protection Ics up to 50kA at 400V for the MS116 and 100kA at 400V for the MS132. A key safety feature is the inclusion of a lockable rotary handle, with a clear switch position indication showing ON/OFF and TRIP status. Further protection is afforded by the inclusion of an optical signal for magnetic tripping, with fault separation to distinguish between a magnetic or thermal trip condition. These are joined by ABB’s PSR9, PSR25 and PSR37 softstarters for motor currents from 3.9A up to 45A and motor voltages from 208 to 600 V AC. Ideal for pump, fan, mixer and conveyor applications, the softstarters are designed to minimise starting currents and reduce the risk of current spikes in small to medium-sized motors. Capable of handling 10 starts per hour, or 20 where a cooling fan is fitted, the softstarters help minimise the impact of motor starting on the electrical network and prolong the life of mechanical components. All available in a standard width of 45mm, the softstarters’ compact design makes them ideal for use in confined spaces and/or where a simple assembly is necessary. To help simplify installation, the PSR can be either screw-fitted or mounted onto DIN rails. All three types of devices – the contactors, manual motor starters and softstarters – are accompanied by a selection of accessories. These include the EF19 and EF45 electronic overload relays, which are used to set up motor starters up to 15 kW / 400 V and provide reliable and fast protection in the event of overload and phase failures. Simplified selection is enabled by just seven options covering a rated operational current from 0.10 to 45 A, with a choice of trip classes spanning 10E, 20E and 30E. Other accessories available for the range include a large choice of common front or side-mounted 1, 2 and 4-pole auxiliary contact blocks, plus interlocks and connection links to help ensure faster and safer installation. The new range is available through both ABB and its strategic industrial partner distributor network. For more information, email ABB or call 02476 368500 ref. ‘new control gear range’. A simple star rating system from Wylex: an easy way of selecting consumer units for the 17th? Everyone understands the star rating system for hotels, the classification system that makes it easy to tell at a glance the difference between what a 2 star and 5 star hotel offers. So why not take this idea and apply it to understanding and choosing the right consumer unit for a project conforming to the 17th edition of the wiring regulations. Wylex are the market leader for consumer units, and have created “Solution 17”, a consumer unit rating using those familiar 5 stars to show what you get from a specific consumer unit assembly. It actually gives a rough guide to seeing ultimate value for money, performance and safety. All types of Wylex consumer units can be installed to the 17th edition; it’s the application of the circuit protection design that dictates how they comply and the resulting levels of protection offered. So, where a 2 star hotel is a basic minimum, the minimum standard for a consumer unit says it will comply to the 17th simply by having been fitted with a couple of 30mA RCDs. But there are times when customers may expect or require a lot more. So what is the Wylex 5 Star Rating? Let’s start by looking at the 17th edition. 2. Every installation must be divided into separate circuits to avoid hazards and minimize inconvenience in the event of a fault, and must take account of the danger that may arise from the failure of a single circuit such as lighting. The possibility of unwanted tripping of RCDs must be reduced (314.1). 3. For parts of the installation that require separately controlled circuits, these must not be affected by the failure of other circuits (314.2). 4. Socket outlets for general use by ordinary persons must be 30mA RCD* protected (411.3.3). *NB. 30mA protection may be offered by any mechanical switching device or association of devices such as a RCBO, RCD or any other equipment designed to open contacts when the residual current attains a given value. If you had to comply with each regulation in isolation, it is quite easy to meet three of the summary points 1, 4 and 5 with basic 30mA protective devices. But in practice, you have to combine these with the other summary points 2 and 3; it is now you need to apply your electrician’s knowledge based on your understanding of the final installation in order to choose the right type of consumer unit, and then come up with the best solution. So, what types of consumers units are available? There are four “generic” consumer unit types considered here: Main Switch, Split Load, High Integrity and Dual RCD. They differ because of the way that they provide 30mA earth fault protection, particularly on independent circuits. Where any independent circuits are required as in paragraph 3, Dual RCD units can never comply. But that’s not to say that 30mA RCD group protection can’t be used. Circuits that are protected by a combination of MCBs and a RCD benefit from two-pole protection under earth fault conditions. High Integrity and Split Load units can both comply with paragraph 3 because they both can accommodate circuits that require independent protection i.e. a 30mA RCBO can be fitted where required. What are then the Wylex star ratings for the different consumer unit types? Figure 1 shows how each type of consumer unit fares against each of the new regulation summary points listed and how the final Wylex star rating is achieved. Professional Electricians should really help to guide the customer and offer the best and safest solution that their money can buy for today and for the future. Wouldn’t you agree that the more independent RCBO protected circuits that are used or maybe added to a consumer unit, the more an installation complies? The “minimum customer’s expectation” will be set by the consumer unit you decide to install to set the overall star rating of the installation, which in turn sets the rating your customers will ultimately give you. With the Wylex “Solution 17” star rating system from Wylex, professional electricians can easily select the most appropriate consumer unit and devices for each individual installation, from a basic minimum standard through to 5 star rating. Finally, like simply choosing a hotel room today, Wylex “Solution 17” star rating system will help installers to specify the most economically and electrically appropriate solution every time..
A wall chart, to remind you of what consumer units are available and their specifications, is available from Wylex, free of charge to any PE reader. About Wylex: Wylex is part of Electrium, one of the UK’s leading suppliers of domestic circuit protection and electrical wiring accessories, being number one and two in the UK market respectively. It brings together three of the electrical industries leading brands: Crabtree, Wylex and Volex, offering its customers a complete range of Low Voltage installation products from a simple household light switch, to the main switchgear in an industrial installation. The latest instantaneous thermostatic electric shower to be launched by leading manufacturer Redring provides an extremely safe and stylish solution that has been designed to suit a wide variety of applications. The Selectronic Premier is available in three versions and builds on the success of the previous Selectronic model by incorporating advanced technology and easy to use features. Representing the very latest in shower innovation, the Selectronic Premier has been carefully engineered to ensure safety is paramount. Fully thermostatic in its operation, the shower can be pre-programmed to provide hot water at a constant and safe temperature, with various temperature lock mode options to eliminate any accidental temperature increases. Simple to use, each unit is controlled via a large, one-touch easy-to-press button with tactile button coding and in addition, a conveniently located large LED display enables easy visibility and legibility. 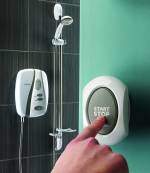 Designed in conjunction with the RNIB, the shower also features an audible feedback response to push-button commands, making it particularly suited to the blind or partially sighted. The Premier Plus variant features an additional one-metre riser rail and a longer shower hose – practical additions for the elderly and less able. The Premier Plus Remote offers the same features as the Premier Plus but also comes with a remote wireless control, a feature that is revolutionary for the care market. Designed to be located outside of the showering area, the ingenious control handset allows you to turn on the shower from a remote location without getting wet, making it perfect for families with young children too. In addition to the safety and ease of use features the Selectronic Premier has good economy and efficiency credentials. The Eco Water-Save function automatically calculates and adjusts the optimum flow rate, taking into account the incoming water temperature and restricting the flow to 6 litres per minute, ensuring compliance with the Code for Sustainable Homes. Also, the Eco Power-Save feature automatically adjusts the power of the heating elements and the flow of water to achieve the desired water temperature. Together these features help to bring dramatic water and energy savings. Part P of the current Building Regulations provides contractors with an opportunity to increase business using IP56 rated outdoor socket outlets and switches. Ashley Robinson, Product Specialist for Crabtree, outlines the opportunity this presents. Part P of the Building Regulations define outdoor installations as: “in or on land associated with the buildings (e.g. : fixed garden lighting and pond pumps); in outbuildings such as sheds, detached garages and greenhouses” This ensures that electrical contractors and installers working on outdoor installations must be ‘competent persons’, but more to the point, it means that installing electrical circuits, switches and outlets outdoors is definitely not allowed to be undertaken by non-professionals. Under Part P, a spur from the mains circuit into a kitchen, bathroom or outdoors has to be installed by a certificated electrician; DIY installation is now a thing of the past! Ignoring this fact could cause the homeowner a problem when moving house, as such an installation needs to be backed by a certificate. It is not unheard of for householders to connect electrical equipment used in their gardens to conventional 13A socket outlets located inside their houses. This can entail the cable running from a power point in the kitchen and passed out through an open window even running over the kitchen sink! Electricians who discover householders who do this should waste no time in telling them how much safer and convenient it would be for a 13A socket outlet to be located outside the house. So what equipment is the best to recommend to installers to make the most of this business opportunity? Although most manufacturers won’t admit it, there are very few electrical accessories on the market that really do live up to the task of being permanently sited outdoors in an unsheltered position. For instance, socket outlets really must close, and more importantly seal, when a moulded plug with a rigid cable tail is inserted. Given that plugs like these are fitted to most outdoor electrical equipment today, a little knowledge before a sale can avoid complaints later, and benefit the user with improved safety. What use after all is an electrical outlet, that doesn’t seal on its live supply, especially when the British weather means that a rain shower is probably just a few minutes away! Worse still might be using a pressure washer with the power connection exposed to the resulting spray. On the positive side, this ‘explosion’ of demand for the provision for outdoor electricity in gardens clearly opens up profitable business opportunities. Waterproof RCD protected 13A socket outlets ought to be used in any part of a house or annexe such as a conservatory, or in a standalone building like a garage, where water might be sprayed e.g. for washing down cars. In any event, homeowners are increasingly treating their gardens as extensions to their living space, looking to enjoy all the facilities provided by connection to the electricity and data supply that they enjoy in the interiors of their homes. Many of them like to celebrate special events with decorative outdoor lighting and, occasionally, for parties, will set up sound systems in their gardens. Barbecues are increasingly popular, and among them now are electric versions, or those that just need power for specific features like spit roasting. And on warm summer days, home-workers might operate their PCs linked by an Ethernet connection to the Internet in the garden, where their home Wifi signal just doesn’t reach. This is all in addition to the mains-powered garden equipment, such as lawnmowers, hedge trimmers, and pressure washers that are now widely used. It is a market that electricians cannot afford to miss out on. 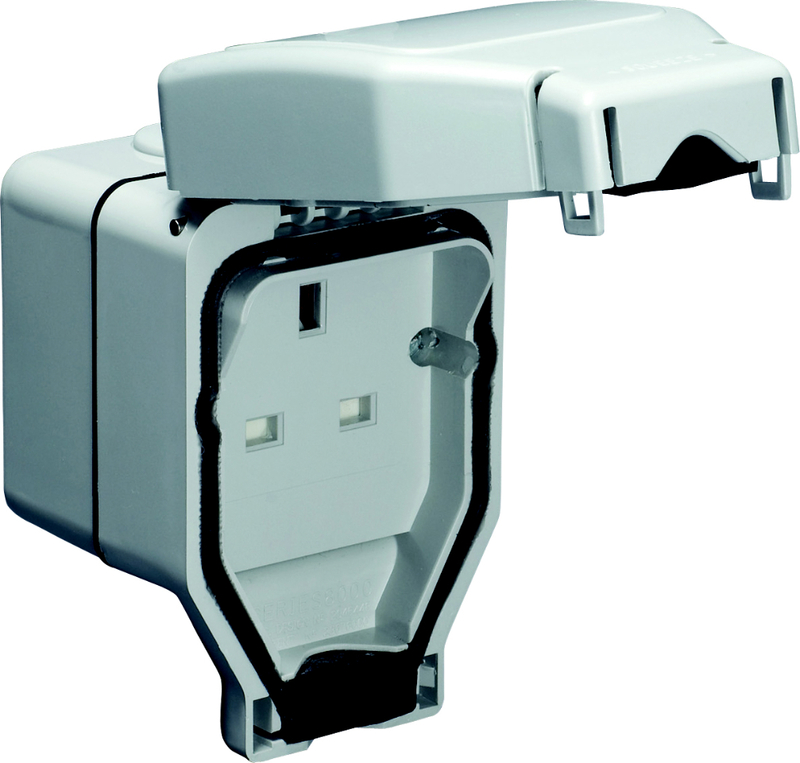 CRABTREE Weatherseal waterproof 13A socket outlets have only recently been introduced into the UK market, but show significant advantages over established brands, with most of the limitations of existing products addressed and designed out. They have an IP rating of 56 while in use; the seal between the lid and main body is made from a brand new, specially developed and highly effective material, differing from the gel-like substances that easily attracts dirt, currently used by other manufacturers. This makes them impervious to external dust and water ingress, and helps the accessory retain its IP 56 rating after repeated use and even when dirty. Also, when a standard 13A plug is inserted into the socket and the cover closed, the plug is entirely sealed off against strong jets of water from any direction and also against dust and small particles. This of course makes Weatherseal ideal for use in grimy or dirty manufacturing environments as well as the everyday domestic garden, a useful fact to have at your disposal. Strangely there are many products on the market where the IP rating only applies with the cover closed but without the plug inserted! Such designs allow the plug to hold the cover open, and are therefore in fact manifestly unsafe for unprotected domestic outdoor use. As well as being waterproof, socket outlets for outdoor use need also to have high mechanical strength to withstand all the knocks that they are likely to get outdoors. Professional Electricians looking for 13A socket outlets for outdoor use that will withstand the test of time are advised to choose those made of ASA (Acrylonitrile Styrene Acrylate) like Weatherseal. This is one of the toughest thermoplastics available today, and does not discolour, crack or fade in UV light. It has a better resistance to chemicals than many other plastics including Polycarbonate, and will maintain its high resistance to impact even in extremes of heat and cold. Weatherseal offers one-gang un-switched and two gang switched sockets with RCD protection if required. 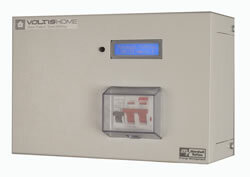 The range also includes 10A retractive and 20A 1 and 2 gang switches, and data outlet modules are available for computer users who want to connect to the Internet while in areas that may be subject to hosing down for cleaning purposes. In common with other Crabtree products, all the multimedia outlets are configurable on site, making it easy for contractors to accommodate specific customer requirements, or even make last minute amendments. An extensive range of enclosures is also available, and in addition, a unique padlockable feature renders Weatherseal proof against unauthorised use. Finally, it’s worth remembering that the home market is not the only area for a business opportunity using Weatherseal. With these 13A outlets now providing such an excellent seal while closed on an energised outlet, light commercial opportunities now present themselves, where perhaps in the past, an industrial connector would have had to be used. Weatherseal is ideal for use in stables, abattoirs, factories, garages, tyre services, warehouses, loading bays, especially those in the food processing industry, and also in chemical disposal or processing plants. And with the credit crunch ensuring more and more of us look to the UK for this year’s holidays, another buoyant market is the caravan park or marina, all of which provide power to their customers’ pitch or mooring from an outdoor socket. For further information about Crabtree contact Electrium Sales on 01543 455000. Leading lighting manufacturer, JCC Lighting, has launched Fireguard Plus, a new range of extremely low energy fire-rated downlights that uses the latest innovative technology to take fire-rated downlights to the next level. Fireguard Plus features Edison LED technology providing extremely low energy performance at 5W (actual 4.7W). The revised England and Wales building regulations Part L, due out in October 2010, state that 3 in 4 fittings need to be low energy and must exceed 45 lamp lumens per circuit Watt. Fireguard Plus, at 45 lumens per circuit Watt, easily passes this regulation. In addition, Fireguard Plus features unique intumescent thermo plastic technology developed by engineers at JCC. The key to this technology is a new thermo plastic intumescent plug which has a distinctive patented design and forms a significant part of this range. The new plug reacts strongly to high temperatures and expands up to 80 times without constraint. It swells to a solid, dense mass, sealing the back of the can to prevent moisture, heat and flames from passing into the ceiling void when subjected to high temperatures of up to 438°F / 220°C. This technology improves on existing market products as the intumescent plug is manufactured to exact specifications, meaning it provides a very robust fit into the top of the can, further aiding the seal in the event of a fire. The addition of cleverly designed and patented ‘petal’ cut-out vents in the plug enables optimal thermal management of the fitting throughout its life and ensures unsurpassed performance. The Fireguard Plus range launches with two key fittings. Both fittings have been developed with an integral LED light source and are available as a standard downlight or an IP65 rated showerlight. The LED light source is 90% more energy efficient than a 50W halogen downlight and the 3000K colour temperature and 40° beam angle makes Fireguard Plus perfect for any domestic application. Available in brushed nickel, chrome and white, Fireguard Plus fittings are ‘A’ rated for energy efficiency, are very easy to fit and forget as they do not require a separate driver and can be wired straight into the mains. QUOTE: “As market leaders in fire-rated downlights, JCC has the knowledge, experience and technology to provide the most up to date, efficient solutions for domestic dwellings. Fireguard Plus is based on tried and tested technology, incorporating the features and benefits of the leading Fireguard range. It utilises the same high temperature adjustable stainless steel ceiling springs, and has a second band of intumescent material within its design for added security”. Firguard Plus provides the contractor and end user with peace of mind. It maintains the integrity of the ceiling as it is independently tested to individual 30, 60 and 90 minute ceilings and its clever construction does away with the need for firehoods. It is a fit and forget solution that is easy to install and with its thermal management, provides a one-stop solution to fire-rated downlights. In short, the innovative construction of Fireguard Plus makes it a one-stop-solution when it comes to fitting recessed downlights that comply with the latest building regulations. Contactum, one of the leading manufacturers of electrical accessories, has launched a new range of metal enclosures, certified to IP65 and designed for multi application use. Each enclosure has been specifically designed to provide maximum durability and protection against the elements, including contact with internal electronic or electrical components and protection against harmful deposits of dust and water jets. Featuring a large door bend on the front of the enclosure and a double bent panel on the back to enhance rigidity, the aesthetic and convenient heavy duty die cast hinges allow for a 180 degree opening. The new range of enclosures, which include a quarter turn lock for easy access and a large drip shield to protect contents, also comes complete with panel depth adjusters, a 12A inner panel, anti vibration nuts, a group strap with anti-vibration hardware and ball bearing hinge pins which can be easily removed. In addition each enclosure is supplied with its very own back plate. Powder coated in 14GA steel with continuously welded and ground smooth seams, the new metal enclosure range is available in a variety of sizes to suit all applications. What did we used to call it? 2nd fix – oh yes, I remember that! If only electricians were able to go to a job, and then just work through until it was done, just like all the other skills on site. But oh no, life’s not like that. First there’s the wiring to do – from circuit protection to outlet back boxes. Then, and usually several days later, when the plasterers and decorators have finished, then and only then, can you return to finish the work by fitting all the electrical accessories and other devices. But all this is about to change with the introduction of a brand new product idea from one of the most established and trusted names in the industry, Electrium, and this new innovation for the electrical industry is called Safety Shield. By using a Safety Shield on each of the wiring accessories, an installer can do both the first and the second fixes at the same time, or put another way, get rid of the 2nd fix altogether. The Safety Shield simply fits between the back box and the accessory to provide a temporary finished surface that the accessory fixes against in the same way that it would fix against the finished wall. It elevates the accessory from the wall surface providing working space for plaster patching and decorating, so that the accessories themselves do not need to be removed. It also provides a frame for plaster patching that guarantees a neat finish without the back box ever being clogged up with plaster. It prevents accidental tiling over the fixing lugs as well, eliminating the problem of having to retro-trim tiles in order to fix the accessory in place. It also forms a trim border for wallpaper and a “cutting in edge” for paintwork. And when all other work is complete, the builder can simply loosen the retaining screws, tear Safety Shield away along its pre-formed break points, and retighten the screws. And if doing away with the second fix isn’t useful enough, it’s the ideal solution for refurbishment and re-wire contracts where it’s necessary to get the power back on and keep the installation fully functional while waiting for other trades to complete their part of the job. For example, the refurbishment of a kitchen usually requires the first fix electrical installation to be undertaken some time before the plaster is repaired and the finishing touches of tiling etc are applied. So, what will the customer do for power and lighting in the meantime? The conventional solution is very labour intensive if continuity of power supply is essential. With Safety Shield, however, it’s simple to keep the power on between trades, doing away with the need for numerous return visits to site to fit and re-fit, and to energise and de-energise circuits, and that means the installer saves time and money while the customer is less disturbed by the process. Electrical safety tests can be carried out and the power can be left on, especially useful on the cooker and the freezer circuits but equally important on lighting and general power. Safety Shield brings numerous benefits to the all trades working in the refurbishment industry. Connaught Construction has already taken full advantage of the benefits of this amazing innovation. Their Health and Safety offices have approved Safety Shield for use on all ‘Decent Homes’ contracts. These contracts often involve refurbishment of large numbers of social housing units. As part of this service, each home must have power available for the tenants throughout the whole of the 21-day refurbishment timescale, and that power must be provided in a manner that is safe for everyone, including the tenants and the tradesmen working on the property. The average saving from using safety shield is estimated at around £132 per dwelling, so if you’re looking for a business opportunity to give you an advantage in these troubled economic times, then by eliminating the 2nd fix, you can make your jobs both more profitable and more competitive all in one go. And then you can laugh all the way to the bank – well if there are any of them left by the time you read this! For further information about Safety Shield contact Electrium Sales on 01543 455000.